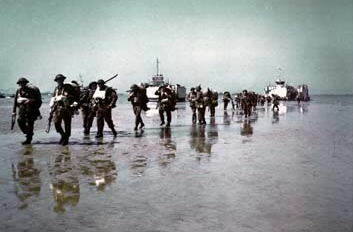 The Canadian third division was scheduled to land on the middle beach in the British sector. Later this beach would be known as the bloodiest beach in the British sector. Juno Beach was like Sword and Gold a beautiful sandy beach with lots of summer homes. Several small villages are located behind the beach. St -Aubin-sur-Mer, Bernieres-sur-Mer, Courseulles-sur-Mer and Vaux. These villages where turned into strongpoints by the Germans. It was the goal of the Canadians to establish the link between the British soldiers that had landed on Gold and those that had landed on Sword. The original plan for Juno was to land 10 minutes later than the British on Sword. This late landing was a result of the sandbank which is located in front of the beach, the Canadians wanted to wait to get enough dept to cross the bank. Due to the bad weather the landing on D-day started one hour later than planned. During the first landings the assault boats were hampered by the pointy rocks which were located just of the coast. These rocks where not visible for the coxswains in the landingboats due to the high waves. The 7th Brigade under the command of H.W. Foster landed at Courseulles-sur-Mer, on the west side of Juno. It had the support of 8 DD Tanks (less than half of the schedules strength). These tank where put into the water eight hundred meters of the coast. The tanks managed to reach the beach and their fire was of significant importance for the troops that landed on this beach. Heavy street fighting developed just of the beach in Courseulles where the Canadians had to capture the village one street at a time. It took the brigade before it was able to break through the German defence in the village and continue it's advance inland. The 8th Brigade under the command of K.G. Blackadder landed on the east side of Juno beach. The DD tanks that had to support them didn't reach the beach. German machinegun fire made a huge number of casualties in the first moment of the landing on this part of the beach. It was a run of only 30 seconds towards the beach wall at the end of the beach where the men were safe from the German fire. Once the men had crossed the beach they were able to break through the beach defences. The engineers blew three gabs in the beachwall. The special tanks proved to be very valuable on Juno beach. On D-day they made 12 corridors across the beach up to the front several miles behind the beach. The Canadians made contact with the British of the 50th Northumbrian Division in Creully, seven miles inland. This division had landed on Gold beach. 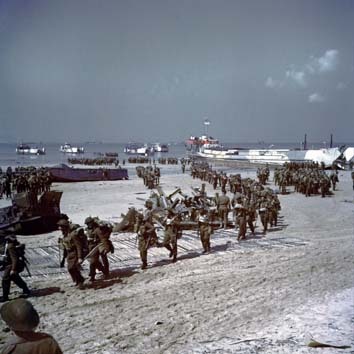 The 48th commandos (British) also landed on Juno, they where scheduled to land at st. Aubin-sur-Mer and had to establish the link with the 41st commando that had landed on Sword. The commandos had to bridge a gab of 11 kilometres. The 48th were able to advance one-and-a-half kilometre, before their advance was halted in the streets of Langrure-sur-Mer. The 41st Commandos where fighting a similar fight in the streets of Lyon-sur-Mer. Because of the heavy defended villages there was a gap of ten kilometres wide between Juno and Sword. This gap would remain open throughout the day. The German high command remained unaware of this gap and that was a very good thing for the allies. The special tanks AVRE eventually mad the difference in the battle at st. Aubin. The last Germans surrendered at 1800. The British where not able to close the entire gap on the first day and in the evening of D-day tanks of the 21st Panzer division slipped into the gab between Sword and Juno. The Canadians ended the day practically everywhere at least five kilometres inland. 21.400 had landed on Juno that first day. Short biography of Charles Arthur Massey, Gunner with the 14th Field Regiment RCA, who was killed on D-day. 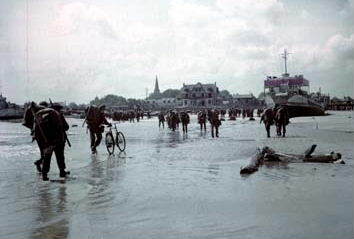 Canadians landing at Bernieres sur Mer on D-day.